If your opponent's LP is 4000 or higher, your LP becomes 1000 less than theirs. You can only activate 1 "Loss Time" per turn. U.A. Goalkeeper, U.A. Blockbacker, U.A. Playmaker, and U.A. 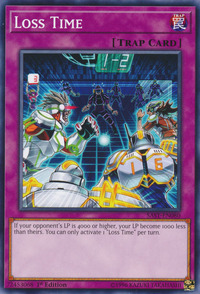 Midfielder appear in this card's artwork.